Cuban doctors assemble to meet Cuba’s president, Miguel Diaz-Canel, after landing in Havana, Cuba, Nov. 23, 2018 (AP photo by Desmond Boylan). The government of Cuba canceled a medical cooperation agreement with Brazil and withdrew thousands of its doctors from the country late last year after Brazil’s new president, Jair Bolsonaro, criticized the Cuban government for taking most of the doctors’ salaries and not allowing their families to accompany them to Brazil. 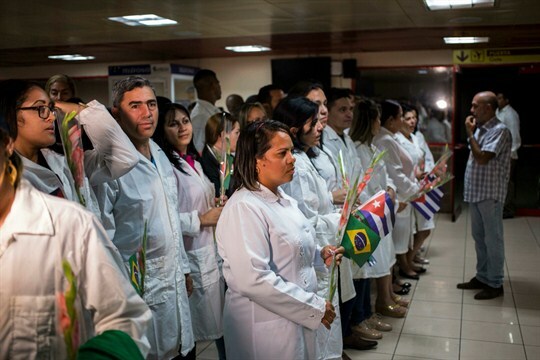 The exodus of Cuban doctors is expected to severely impair health care services for millions of poor Brazilians who depended on them. In an email interview with WPR, Albert Ko, a professor of epidemiology at the Yale School of Public Health who has conducted research in Brazil, discusses the withdrawal’s other likely implications, both for Cuba’s medical diplomacy initiatives and for Brazil’s marginalized communities.